Parmesan chicken is such a tasty treat. Thing is I don’t quite understand why the breading is there. Sure, it might be traditional but around here I don’t think that really cuts it. Why not change that breading into something that actually adds more flavour to the dish? That way this indulgence can be oh so tasty and oh so healthy at the same time. Something about making the breading go away just plain makes me feel less guilty about putting the star oh the show on there…you know…the parmesan. Place the chicken breasts in a bowl or plastic bag. Cover with the dressing and allow to marinate atleast 4 hours. Pour the spices (including the salt and pepper) in a bowl. Remove the chicken from the marinade and dip the chicken in the bowl of spices to lightly coat. Place the chicken on a sprayed baking pan or dish. Remove from oven and sprinkle 1 tbl of parmesan on each breast. Place the chicken on the broiler for a minute or two until the cheese is your desired level of bubbly. Makes two servings. Each serving contains 117 calories, 3.6 grams of fat, and 1.9 grams of fibre. We served this on a bed of whole wheat spaghettini (one serving according to package), 1/2 cup of tomato sauce, and a salad on the side. An awesome meal! Especially when you can find so many low calorie and low fat tomato sauces out there that will give you two servings of fruit and vegetable for that 1/2 cup! Ofcourse I have my own tomato sauce recipe but that is another story hehe. 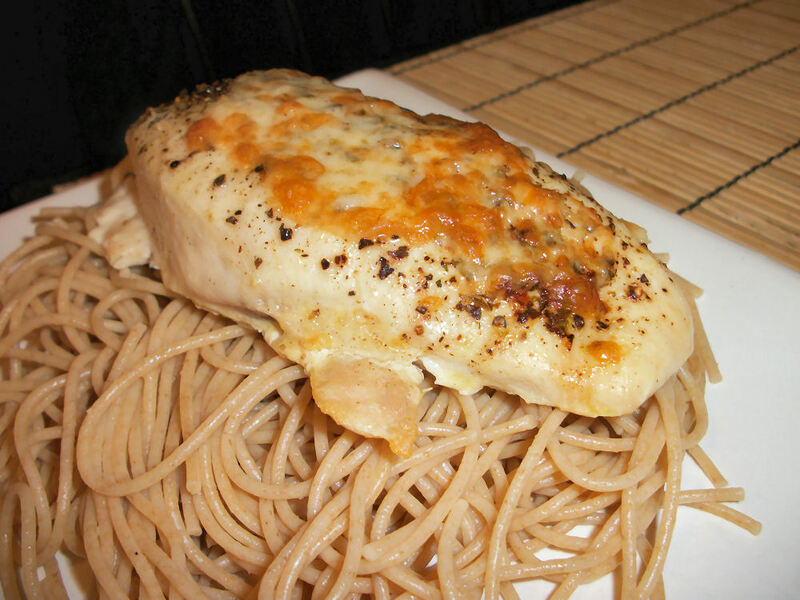 This entry was posted in Comfort Foods, Craving Buster, Dinner and tagged Cheese, Chicken. Bookmark the permalink.